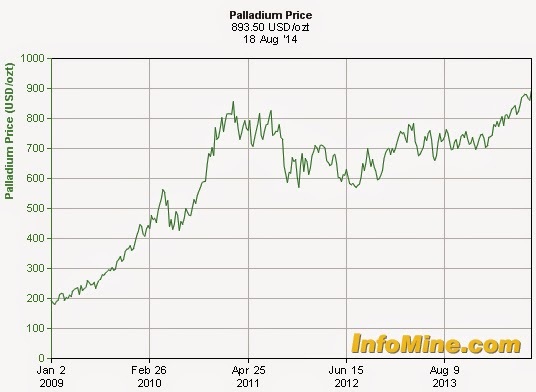 Palladium hit $900 a troy ounce on Monday for the first time since 2001, taking this year’s price gain to 25%. The precious metal has benefited from real and potential supply disruptions in South Africa and Russia, the two main producing countries. Together they account for close to 80% of global supply of palladium and 70% of platinum output, which are mainly used to clean emissions in automobiles. But while one worry is already over (the end to the devastating strike in South Africa last July meant that roughly 10,000 ounces of platinum and 5,000 ounces of palladium have begun to find its way onto the market), fears regarding sanctions against Russia over its intervention in Ukraine have kept prices on the boil. After dipping to $836 an ounce on August 6, as investors took profits, the metal price has soared steadily on fresh speculative interest. Palladium futures for September delivery jumped 0.3% to $897.10 an ounce at 10:17 a.m. on the New York Mercantile Exchange. Earlier, the price reached $902.75, the highest for a most-active contract since Feb. 22, 2001. The metal climbed for the ninth straight session, the longest rally since July 8. Precious metals analyst at Mitsubishi, Jonathan Butler, said in a note Monday the palladium price had reached its most expensive relative to its sister metal platinum in 12 years. Platinum, also used in auto catalysts, traded at $1,440 an ounce on Monday and is nowhere near record levels. 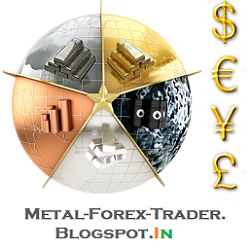 The precious metal hit $2,253 in March of 2008 and has never been above $2,000 since then.